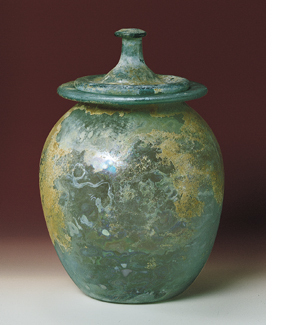 This massive glass jar, which originally will have been used for food storage in a Roman kitchen, shed its domestic function when it became the urn for someone's cremated remains at the end of a Roman funeral. In burial, it was a most likely given some protection by being placed inside another container made of pottery or lead sheeting. 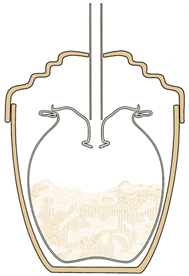 It is no chance that this jar's lid has a hollow, pierced-through knob. When turned over, it could act as a funnel by which the deceased could receive an offering of wine via a lead pipe that linked the burial to the ground surface above. Such an offering would be part of the graveside meal (cena novendialis) that marked the end of the period of full mourning, and of each of the many ceremonies of rememberance that were included in the formal Roman calendar. Avni, G. and Greenhut, Z., 1996: The Akeldama Tombs, 95-103 (Jerusalem: Israel Antiquities Authority). Baratte, F., 1989: "La Verrerie dans l'Afrique Romaine: Etat des Questions," Kolner Jahrbuch fur Vor-und Fruhgeschichte 22, 141-149. Fleming, S.J., 1999: Roman Glass: Reflections on Cultural Change, 97-101 (Phildelphia: University of Pennsylvania Museum). Sternini, M., 1990: La Verrerie Romaine du Musee Archeologique de Nimes I, items 10-14 (Nimes: M.A.N.). Toynbee, J.M.C., 1971: Death and Burial in the Roman World, 43-64 (Ithaca: Cornell University).